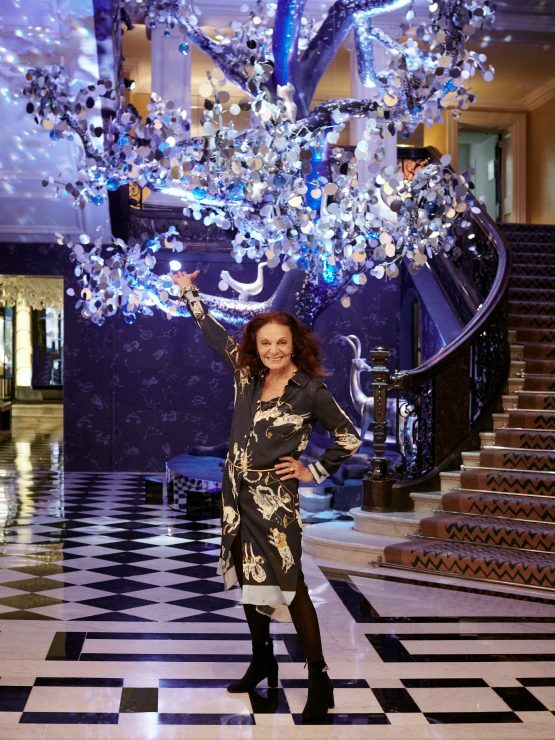 My dear readers, with all my heart I would like to wish you a Merry Christmas 2018 with the iconic Claridge’s Christmas Tree, that is designed this year by fashion icon and long-time friend of the hotel, Diane von Furstenberg. 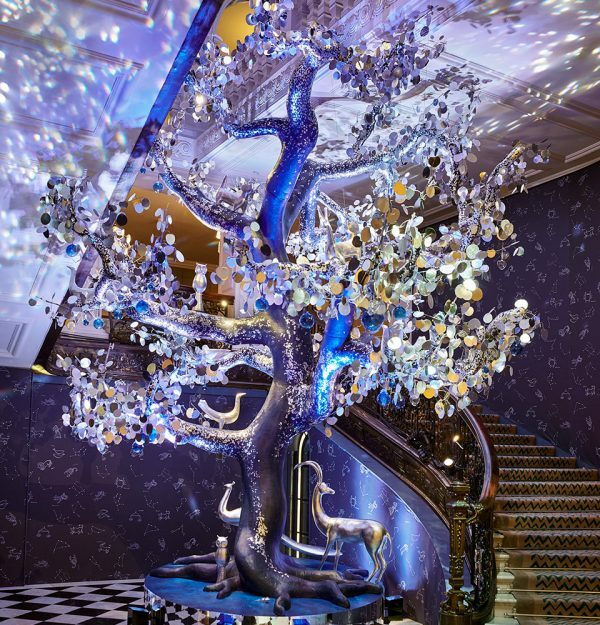 This is the ninth time that Claridge’s has invited a distinguished guest to reinterpret the tree in their own distinctive style. For the previous collaborations, click here please. «The Tree of Love» is inspired by Diane’s passion and strong belief in the power of love, symbolising life and nature, and drawing particularly from the creative influences of the astrological world. 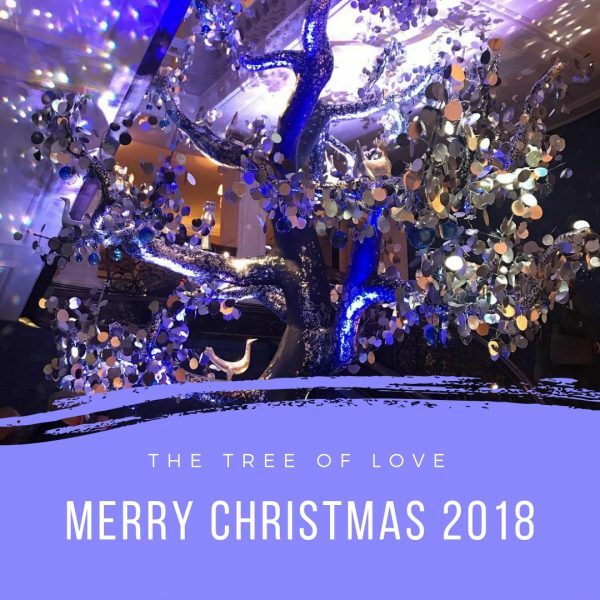 This six-metre sculptural tree is coloured with a blue iridescent lustre and shimmer, and is decorated with over 8,000 hand painted silver-leafed leaves, glass spheres and 150 hand-blown glass hearts. It plays host to six different silver-leafed abstract designed animals – an owl represents knowledge and wisdom, a dove symbolises peace, a horse conveys strength and endurance. Highlighting the importance of nature within «The Tree of Love», a sculptural deer representing gentleness sits at the base, a peacock representing beauty, and nestled gently sleeping, is a silver-leafed mouse to symbolise curiosity. The idea of the tree is that all is derived from the universe and the tree winds its way upwards towards the heavens from its roots. Diane has also included important, symbolic words that have long been her mantra including Peace, Harmony, Knowledge, Truth, Freedom, Enlightenment and Wisdom. 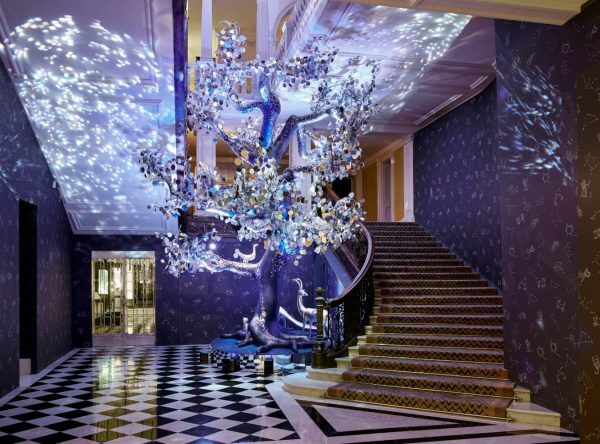 In order to make this a fully immersive experience, the iconic London hotel’s lobby has been reimagined under her creative vision with a magical midnight blue skylight covered in dazzling stars and astrological star signs from the constellation. To a magical Christmas time filled with love and laughter!